I am about to go on vacation this coming Thursday - Sunday (I know, that is a mini vacation, but hey...at least I do not have to go to work). So what do I get in the mail? A jury duty summons for Wednesday (the day BEFORE I go on vacation). I called them and asked if I could come the next week....can you believe they said yes? So I got it moved to the 6th of November instead of the 31st of October. Then, it was Antonio's 2nd birthday on Wednesday. Paige got him a small basketball set....and his halloween costume came in...he is going to be a skeleton...he was wearing the smiling skeleton hat and playing basketball...the pics are a little blurry, but he was on the move! Yesterday was his birthday party. Paige decided to have it at Peter Piper Pizza...he had such a great time. Paige made him a Tres Leches cake FROM SCRATCH! I am sooooo proud of her. She is a wonderful mom! Here are some pics of Cataleya, Celeste and the birthday boy. Before Antonio's bday party, I got to knit in the morning to early afternoon....I worked on my Nuvem. I actually got to the ruffle. I did 1080 kfb's (knit front and back of the stitch) which now makes 2160 stitches on my 60" needle...those stitches are packed on there. I am so excited....I cannot wait to bind off this puppy...but first I have 12,960 to 15,120 stitches to still knit! My renters have moved out and I want to do some painting to the house, so I ran by Lowe's really quick and had Paige pick a color...first it was timeless taupe, then Toast...she wanted them to mix those two (which they can't do) so Imperial Sand won! We are going to Big Bend this week. Leaving Thursday and coming back Sunday or Monday (I took Monday off of work to just recouperate). I will take pics and let you know how it goes. I am taking my knitting and while I am sure I will be able to knit on the way there and on the way back....I am not sure I will get any knitting done while I am there....but I have so many things I want to knit on! Oh, and the pom pom blanket for my friend, Jill, is done. I told her over a year ago that I would make her one...but you know how selfish knitting always seems to get in the way! I also had a stash enhancement this week that I am ITCHING to cast on to something....probably the Bay of Fundy (which I will call BOF scarf/shawl). This is Ancient Arts Yarn in Calico Cat colorway....portion of proceeds go to the meow foundation....I just love the color!!!! I know I have had much more going on.....Precious (my Yorkie dog got a yeast infection on her back...I did not know you could get one on your back....weird), and a bunch of other running around I will not bore you with....but now it is time to get ready for my small vacation....I am super excited. Jaime and I are going to borrow my friend's (Darlene) trailer tonight so we can trailer the motorcycles. That is a funny story in itself...it was stolen 4 months ago and Bruce (Darlene's wonderful hubby) saw a guy with it hooked to his truck the other day so he followed it and it was his (he had his driver's license number welded into it) and got it back and then I asked to borrow it and they were so wonderful to say yes.....then it is time to pack, pack, pack.....I cannot wait to get the heck out of dodge and just relax (and knit) for a few days!! You guys have a great week! BIG BEND HERE I COME!!!!!!!!!!!!!!! I love the Calico cat yarn. I picked up some of the Siamese colorway at HCW in Austin this weekend. A friend bought some Calico yarn but her knitting is limited to dishcloths and she did not like the way it turned out. I am thinking it would have made a beautiful boneyard shawl. But I loved them all. But settled for the Siamese colorway. Love that you are getting away for a few days. 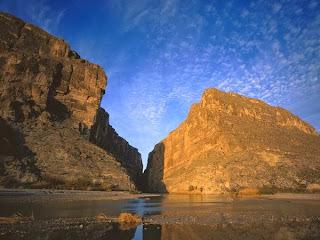 Enjoy the Big Bend area and have lots of fun. Wondering what happened to your blog? No new updates. I know I know you took some vacation time, but we, avid readers of your blog, anxiously await your next blog.